Dental Implants – What’s Involved? Discovering you may need a dental implant can be daunting. You will no doubt have questions about the procedure and the costs involved. You will also want to find the best dental surgeon available to perform the procedure. At Coburg Dental Group, we are dedicated providers of outstanding dentistry. Dr Jeff Kestenberg who holds a Master’s Degree in Prosthodontics, and our other dentists will work together with Dr Claudia Beltrans- a dental surgeon to provide you with the best dental implant treatment and after care. Dental implantation is a procedure to replace missing teeth, or teeth that we cannot save through conventional means. 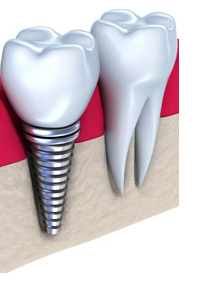 Dental implants are titanium screws that are surgically inserted into either the upper or lower jawbone. The dental implant fuses with the living bone. This fusion is called ‘osseointegration’. Implants are man-made replacements for the root portion of missing natural teeth and provide the foundation for either a crown or bridge to be permanently attached. Dental implants are also used to stabilise loose dentures or to replace a denture with a fixed bridge. This treatment can vary from single tooth replacement to a complete upper and lower arch replacement. Adequate bone with regards to quality and volume (bone quality and volume will be determined by an x-ray and clinical examination prior to commencement of any treatment). Dental implants function in a similar way to natural teeth, ensuring all your nutritional needs are met. Besides improving oral function, implant-supported teeth are designed to look like natural teeth both to you and to others. With dental implants, you are simply more confident. The sore gums and bulkiness sometimes associated with dentures is eliminated. You are also assured your teeth are stable while eating, and you do not experience any hindrance when speaking. The long-term safety and effectiveness of replacing lost teeth with dental implants is well established. The first stage surgery takes approximately 1 hour and is performed under a local anaesthetic in the Melbourne dental surgery. An implant is surgically inserted into the jawbone and then left undisturbed for approximately 3-4 months which allows the implant time to integrate or fuse with the jawbone. A temporary tooth or teeth are made to provide normal appearance and function in the interim stage. The second stage involves a 30 minute appointment whereby a small piece of gum is removed and the implant post is attached to the buried implant. Both procedures result in minimal discomfort. The dentist will provide post-operative instructions and prescribe medication to alleviate any discomfort if necessary. If you are considering dental implants, Coburg Dental Group are a leading family dental clinic and we are here to help. Providing dental care in North Melbourne for over 80 years, we are committed to delivering the best possible treatment experience. Contact us today and we can talk through any queries or concerns you might have.